It has a good weight and for a girl I could retract it back closed on my 1st. try. I like this baton very much so I feel pretty safe knowing I can fight off an attacker if need too. I Love Mine ,Ordered 2 For A Weapon Making Project, At First It Was Pretty Hard To Get Them To Retract, With Some Practice I Found Out How To Get Them Closed Pretty Quick, I Like How They Are Balanced And Light Weight. Im Thinking Making Some Adjustments To Were I Can Connect Them Into A Bow Staff. 4/5 Baseball bat power in your pocket. Pros: Best Baton you can buy. Will go through anything without a problem. Can disarm knife attacks very simply. Basically it's a 20in titanium junior baseball bat with finesse, that you can wear rather than a knife and absolutely destroy anything or one. 8in long when collapsed (feels smaller and can be concealed with permit of course, easily). Cons: KEEP IN POUCH AT ALL TIMES. The spring is extremely tight and can easily break an arm, put an eye back into the skull, or through it. Seriously it shoots out like a jet. Handle takes a little getting used to. A Pro/Con --_ Hard as living hell to fold back in. So don't worry about it going back into the hilt on you, but don't expect to put it back in easily. This is without a doubt one the best batons I've ever owned. I actually have two (one for practice, one on me). The ONLY problem with this baton is that once, it is out, even oiled it will take a hard slam to go back in while holding the release lock. This is actually great though. I can thrust full force without it retracting. And if you want wondering how strong it is considering it is an extending baton, well its strong enough to break cinder blocks / trashcans / etc without a dent or bend in it. This baton is viscous. It will do what you need it to do and be as shiny and dent free as it was out of the box. I generally don't but I decided to give this credit, so I wrote this review (the only one I believe I have written on here) strictly to congratulate and encourage you to try this before a knife, and not be afraid of it's cheap price tag. Nothing about this baton is cheap. 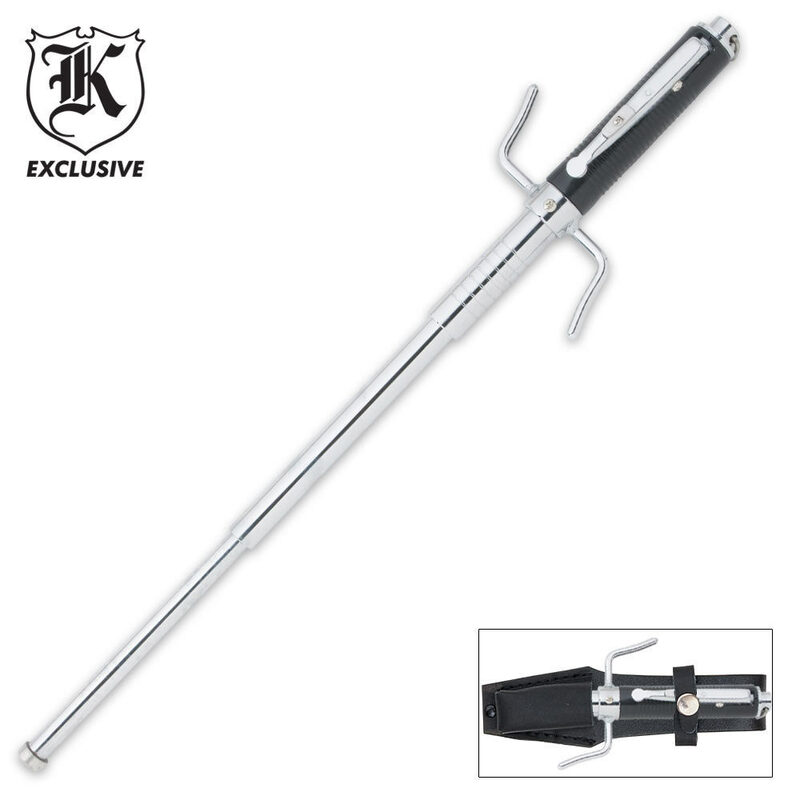 The handle can easily disarm blade thrusts from an attacker. And lets be real here, if someone has a knife on you, which is more intimating/would rather have? When that baton snaps out, generally that ends the would be mugger right there (of course however if he is 15m+ away with a pistol drawn then well get a gun). Best buy I've ever made on this site. Twice. The automatic baton is not for girls and if you can not figure out how to make it retract(?) try youtube(?) And let's be honest......Do you want a defense weapon to collapse while you a fending off an attacker? I DO NOT! And why would you. So I give this 5 stars, for doing exactly what it should be a stealthy and a solid form of protection. (retract it later, OR WORK OUT MORE ?) While I have some issues with knives that are advertised as sharp and are not so much. This baton is brutal. Just holding it in your hand makes you feel tough, and that sound it makes when it extends is very intimidating. The holster was a little hard to figure out, but once I realized the trigger went in to the hole at the top it all worked out. All in all this is an amazing weapon. Impossible to retract. You need a hammer. I'm strong, but I can't! Very good i bought it for my son he is 18 he loved it but one big problem We were walking our dog he brought it with us. He had it in the holster and when the police had drove by they saw it. They stopped us and gave him a felaney and they said its ilegal to own one. Also we live in sa Texas. This is the coolest extendable baton I have ever had. Be careful with the automatic extending tough. You can hurt someone just by pushing the button. The spring in this baton is very powerful. This is the earliest weapon I've bought from BudK, and one of the only ones I've had to use. The grip is a little short and slippery for my taste, but a nylon rope in the handle loop and it's fine. The first time I used it, the sound of the spring engaging scared the h*** out of the guy breaking into my car.